Youth literacy rate reflects the outcomes of the primary education system over the previous 10 years, and is often seen as a proxy measure of social progress and improving capability for economic achievement. The rate represents the percentage of people aged 15 to 24 years who can both read and write with understanding of simple statements. Generally, ‘literacy’ also encompasses ‘numeracy’, the ability to make simple arithmetic calculations.Similar progress has been made in terms of adult literacy in the basin. Adult literacy here encompasses ages 15 and above for both sexes. Education and literacy are key indicators of quality of human labor force. Overall, adult female illiteracy rates are higher than adult male illiteracy rates, and this holds for all countries. 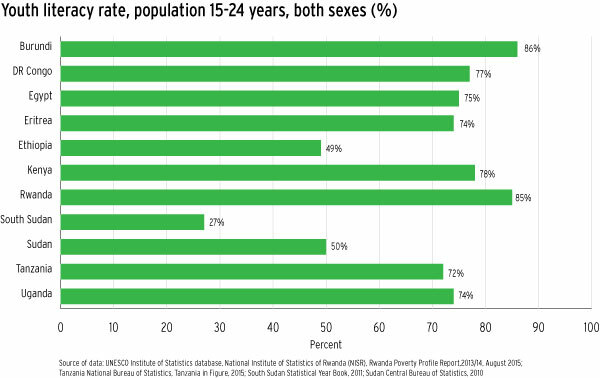 Again, male youth illiteracy rates are highest in Ethiopia, while Kenya has the lowest youth male and female illiteracy. 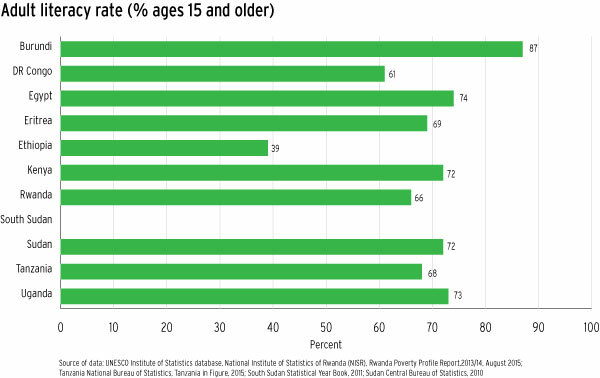 With the only exception of Kenya, youth female illiteracy rates are higher than youth male illiteracy rates. This implies that females, in general, tend to be more illiterate than their male counter parts in all countries. A gender focused education strategy is therefore highly desirable for effectively engaging female into the socio-economic fabric and address gender inequities.